The initial stages of preparation are the most crucial in many respects. 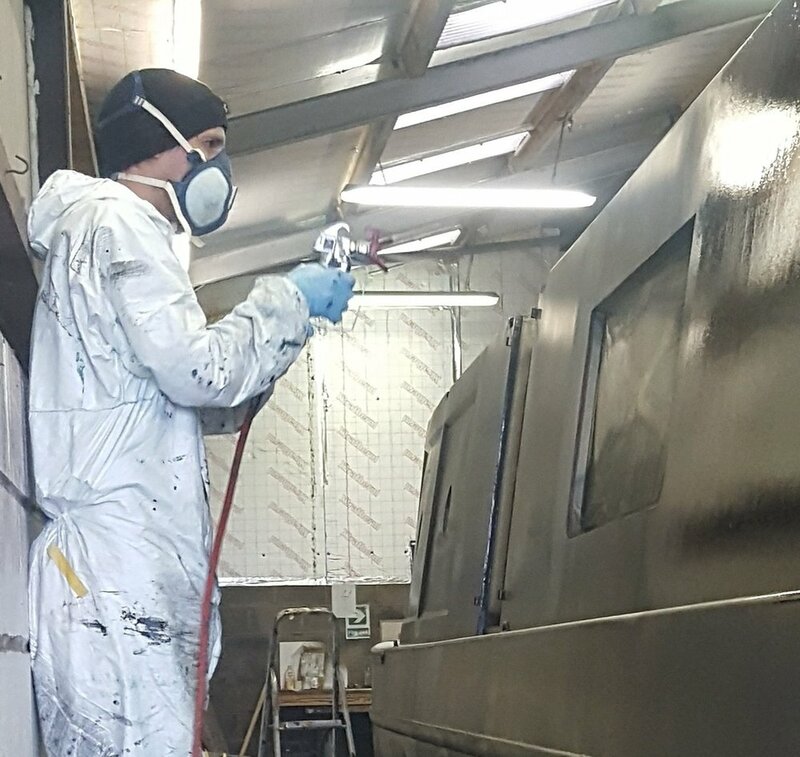 Depending upon your needs we will manually remove all your existing paint or organise for the boat to be shot blasted. and mill scale is ground off from behind them. Broken screws are attended to. Anything that can be removed is removed. We prefer to work from as close to a bare hull as we can. The insides of windows are covered in plastic sheeting to prevent excess dust from entering your narrowboat. We wipe down the entire boat with a de-greasing solvent to ensure the steel is clean for when we apply our first primer. We apply a two pack epoxy primer using an airless spraygun. Spraying allows for consistent and thick application of the primer. The following day International Interfil 833 filler is applied to any blemishes in the steel. After 24 hours the filler is sanded flat. We finish the priming stage with a second coat of two pack epoxy. The paint is then given time to cure. With these two coats of primer we are able to reach a thickness in excess of 150 microns. 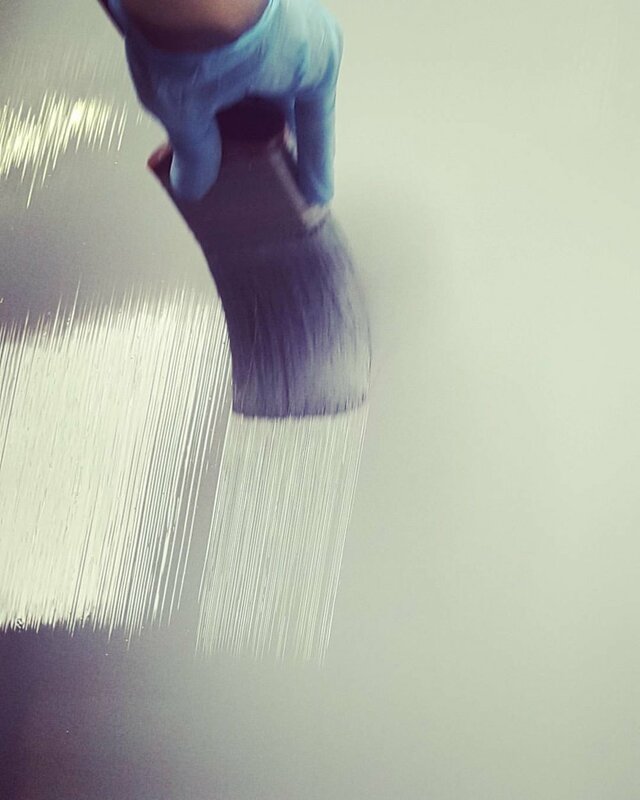 Reaching a lustrous gloss finish requires depth of paint and careful application. We carefully sand the primer layer to provide an adequate mechanical key for the gloss coats to adhere to. ensuring that each coat has had time to dry. By the time the top coat of gloss has been applied you will have in excess of 200 microns of paint on your boat. If your paint scheme requires a second colour then it is applied on top of this foundation. We clean the windows and put them back in replacing all the old screws with stainless steel screws. If you request it we can have fittings powder coated to make them look smart. We can also polish and lacquer brass work. When these details are attended to we begin the process of adding a second colour or coach line. to ensure everything is neat and in proportion. We mask around the second colour and cover everything else with brown paper to avoid any overpaint. Two or three coats of gloss are usually sufficient to provide adequate coverage for your second colour and coach line. Finally, the signwriters work their magic and add detailing to the boat. If you have a vision of what your signwriting should look like then they will work closely with you. You could of course give the signwriter a theme and ask them to improvise. Some of our most striking boats are the result of giving our signwriter free reign! From start to finish the whole process takes between four and five weeks depending on the length and complexity of your narrowboat. We encourage you to visit during this time to ensure that everything is to your liking.